Most Story of the Week readers probably heard of last week’s [October 2012] daredevil stunt by Austrian skydiver Felix Baumgartner, who jumped from a capsule in a pressurized suit twenty-four miles above the sea level, plunged to the earth for ten minutes (including more than four minutes in free fall), and broke through the sound barrier with a peak velocity of 834 mph (Mach 1.24). Baumgartner’s feat reminded us of the extraordinary story of Lieutenant Colonel William H. Rankin. Half a century ago, Rankin was flying solo in a jet fighter when the plane malfunctioned while traveling in excess of 500 miles per hour. He ejected from his plane without a pressure suit about nine miles above sea level—that’s more than three miles higher than the peak of Mt. Everest. Worse, he plummeted straight into “one of the most violent storms ever recorded on the East Coast,” turning what should have been a ten-minute fall into forty horrifying minutes. 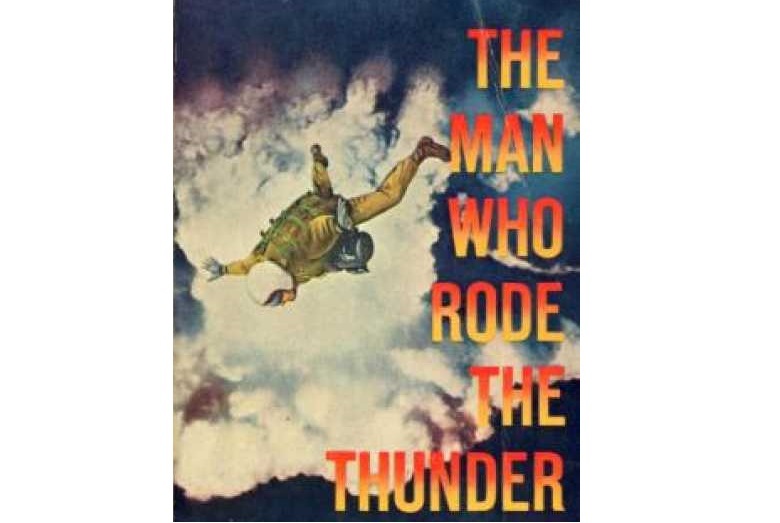 Rankin wrote about his experiences as a pilot in a book called The Man Who Rode the Thunder, which has been long out of print and has become fairly difficult to find. 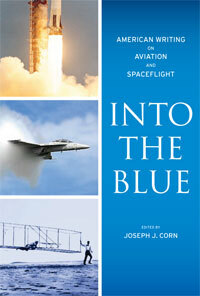 This week’s selection is the section describing his fall from the stratosphere. Rankin died on July 6, 2009, in Oakdale, PA, a suburb of Pittsburgh. Postscript: This selection was, far and away, our most widely read Story of the Week offering to date and elicited appreciative, delighted, and (above all) astonished reactions from readers. Since we posted the story, many readers have written, wondering what happened to Lt. Col. Rankin after his extraordinary nine-mile, forty-minute fall from the stratosphere. The sequel is surprisingly anticlimactic: After he landed on the ground, Rankin walked until he came to a country road, where he flagged down a car and was driven to the small town of Ahoskie, NC. (Several cars passed by without helping—one can only imagine the sight he presented to drivers!) When he and his rescuer arrived at the town store, an ambulance was called. He spent the next several weeks in the hospital, recovering from various internal injuries and frostbite and receiving visits from journalists. International media coverage included a feature story in Time and a photograph in Life of Rankin smiling cheerfully in his hospital bed. He eventually returned to duty. His plane crashed harmlessly in a field. I was not panicky. Mentally, I was fully prepared to eject. By training, by experience, by instinct, I knew exactly what to do and did it rapidly but deliberately. . . . If you don't see the full story below, click here (PDF) or click here (Google Docs) to read it—free! Incredible indeed! I haven't read anything so vivid,graphic and intense that I vicariously suffered the FREE FALL. The second time I read it, I was sure the account wasn't at all about a physical FALL through space but about the mighty, indomitable spirit! Once Rankin switched on the spirit, he ceased to be a BLOB OF HELPLESSNESS,A SPECK OF HUMAN DUST,rolling down at the mercy of the elements.His audacious spirit saw him through the catastrophe. The moral of the story - don't give up however bad the situation might be so that you can be around to tell the story. Well, OK. What a perceptive way to record what must be a unique event. Unique, dangerous, and horrific. Yet I would prefer good literature to these "pulled from the headlines" themes. Thanks, though. I will never forget this or look at a thunderstorm in the same way again. did he walk miles or was he aided by others? cause harm on the ground?